Introduction. Hierarchically organized Hamiltonian systems. Population dynamics in a hierarchically organized system. Couplings between the biochemical and the cellular levels. Hierarchically organized population of neurons. Hierarchically organized ecosystem. Hierarchically organized economics. Thermodynamics in a hierarchically organized system. Conclusion. Appendix: microcanonical ensembles with non-equiprobable states. 101 lit. refs., 25 illus. One of the most fundamental and efficient ways of conceptualizing complex systems is to organize them hierarchically. A hierarchically organized system is represented by a network of interconnected subsystems, each of which has its own network of subsystems, and so on, until some elementary subsystems are reached that are not further decomposed. 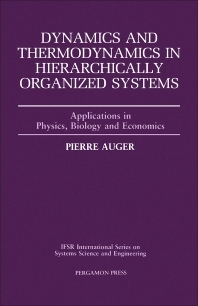 This original and important book proposes a general mathematical theory of a hierarchical system and shows how it can be applied to very different topics such as physics (Hamiltonian systems), biology (coupling the molecular and the cellular levels), ecology (coupling the individual, population and ecosystem), and economics (coupling the sectoral, regional and national levels). The first attempt to develop mathematical frameworks for conceptualizing such systems only appeared in the early 1970s, and it took another decade before these mathematical frameworks were applied to various specific contexts of the sciences of the natural. Much of this work has been pioneered by the author, and he presents a more thorough work which will have a major impact on shifting current thinking in the sciences of the natural to a more holistic basis in which several levels of hierarchically organized systems are viewed in an integrated fashion. For mathematicians involved in systems analysis; systems researchers, in particular those interested in biological, population, economics and physical systems. State University of New York, T.J. Watson School of Engineering and Applied Sciences, Binghamton, New York, U.S.A.